GCSE Bitesize has revision pages (that take you through the topic), a test and an activity – scroll down to ‘metals & their uses’. GCSE s-cool – Metals & the Reactivity Series – revision notes & animations, practise exam questions & a revision summary. For Doc Brown’s Chemistry quizzes, word-fills, crosswords and study notes go here and just scroll down. Skoool Chemistry – click on ‘3. Metals, Ores & Rocks’ for excellent lessons on Metals & the Extraction of Metals; also a glossary of key terms. Chemactive worksheets & answers just click on ‘Metals questions’. Two videos from TutorVista cover the physical properties of metals (5m) and the chemical properties (8m 15s). And this is a 1m video on malleability & ductility of metals. Naked Science Scrapbook answers the question what is an Alloy? (6m 45s). 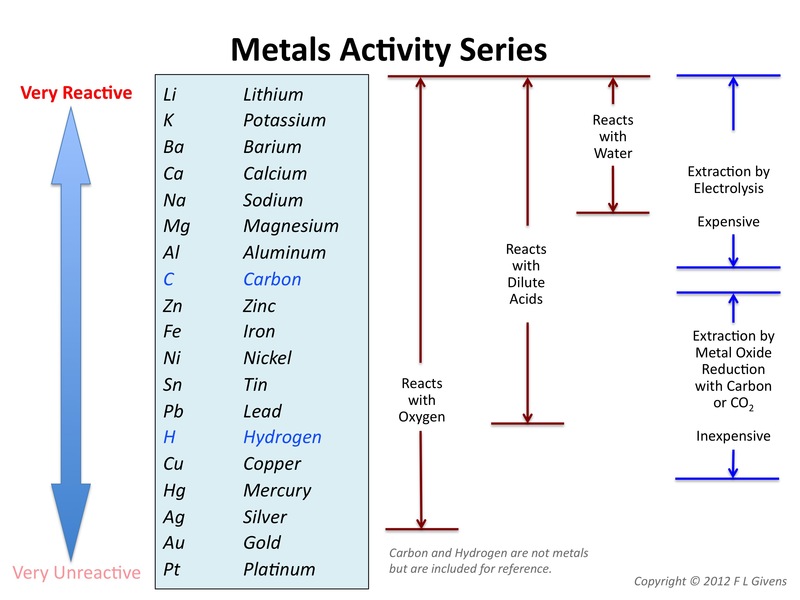 Revision on the Reactivity Series from KS3 Bitesize. IGCSE Chemistry, a 25m lesson from ChemistryKlipz covers metal reactivity (from 6m 20s to 11m), rusting (to 13m 50s) & displacement rcts (to 18m 30s). Demo – heating copper oxide with carbon powder to extract copper (1m). The Blast Furnace is covered in Ore to Steel – HowStuffWorks: a quick 2 minute vid, The Blast Furnace a 1m53s vid from CORUS & here is an animation of a Victorian blast furnace. The RSC presents Iron & Steel – a 6m 37s vid going into more detail than you need for the exam but its worth watching. This entry was posted in C9 The Periodic Table & C10 Metals and tagged alloys, metals, ores blast furnace, reactions, reactivity on April 16, 2016 by Mr Cartlidge.